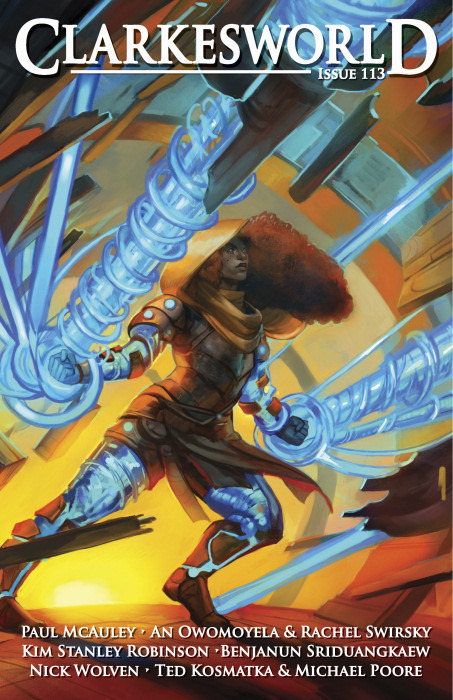 "The Fixer," by Paul McAuley [bio] (edited by Neil Clarke), appeared in Clarkesworld issue 113, published on February 1, 2016. Pro: I like the idea of a story about an AI that's struggling to implement its programming despite the fact that it makes no sense under changed conditions. Con: Why does the fixer play games with the AI? Why talk to it at all? Why bother to try to uplift the hominids? It's impossible to sustain suspension of disbelief. The ship AI reports emotions like fear and anger, but it makes no sense that anyone would have programmed it for anything like that. I perhaps liked it a little more than you, for elements like the idea of the aftermath of an AI having Gone Wrong, but then there was the terribly on-the-nose mention of the monolith to drag it back down. Yeah, the monolith was kind of a low point, wasn't it? At least the ship AI didn't turn out to be named HAL. I liked the idea of the AI doggedly trying to make things work on the planet. But the Fixer actually taking the time to become a hominin and going down to the planet to have a completely unnecessary conversation with the AI while lounging there wearing shorts and smoking a cigar was pretty silly.